This is Netta Prosser from Lossiemouth who is stepping down from the Laeder of the Joan and Darby Club. Netta also was joint winner of the Lossiemouth Citizen of the Year. Photographed on Friday 13 July 2018 by Brian Smith T/A Jasperimage ©. PIC CONTENTS:- Netta will be ralaxing more with a cup of tea and her home is open. The Lossiemouth Darby & Joan Club offers an opportunity for older people to socialise with friends. It has been a fixture in the town for more than 50 years, but a volunteer is needed to take over as club leader. This is due to previous manager Netta Prosser stepping down after 40 years at the helm. Mrs Prosser said she was determined to find someone new to assume leadership of the club, due to its importance to Lossiemouth. She added: “I am doing everything I can to try and get someone in to replace me. “For some of the older people in the town, it is the only time they leave the house and this club is important in combating isolation. A recent winner of Lossiemouth’s Citizen of the Year award for her invaluable support of the local community and various charity organisations, Miss Prosser is offering her experience and wisdom to any potential volunteers. She said: “I’ve been in charge for over forty years, and I am now 83, so I want to get someone in to take over. The Darby and Joan Club currently has around six volunteers and 40 members who meet weekly at the Lossiemouth Community Education Centre on Tuesdays from September to November and January to April from 2pm till 4.30pm. 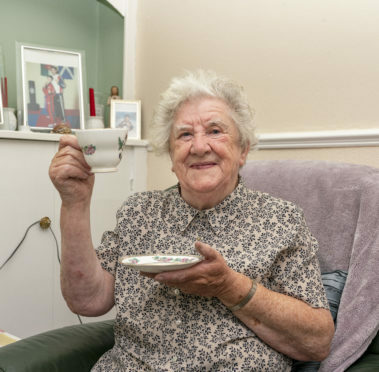 Run by the Royal Voluntary Service, it helps to reduce the isolation and loneliness that can set in when getting out and about is difficult for older people. To find out more information or to volunteer your time, contact Tracey Peden on 07736 825329 or email tracey.hann@royalvoluntaryservice.org.uk or visit www.royalvoluntaryservice.org.uk.